The RP Photonics Buyer's Guide contains 34 suppliers for Faraday isolators. A Faraday isolator is a kind of optical isolator, i.e., a device which transmits light in a certain direction while blocking light in the opposite direction. Faraday isolators are based on Faraday rotators and constitute the technologically most important type of optical isolators. A variant is an optical circulator, having at least three optical ports. Light injected into port 1 will exit at port 2, while input at port 2 will be sent to port 3, and input at port 3 to port 1. The simplest type of Faraday isolator is polarization-sensitive in the sense that it works only when the input beam has a prescribed direction of linear polarization. Here, a properly polarized and collimated input beam passes a first polarizer (pol 1 in Figure 1) with minimum loss, then a 45° Faraday rotator, and finally another polarizer (pol 2) with its transmitting axis being rotated by 45°, such that the transmission losses are small. Figure 1: Setup of a polarization-sensitive Faraday isolator. The double arrows indicate the polarization directions of a forward and backward-propagating beam. Figure 2: A selection of Faraday isolators for different power levels. The photograph was kindly provided by GMP Switzerland. 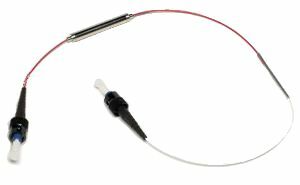 When light is reflected back to the output port of the isolator with an unchanged polarization state, it can fully transmit the output polarizer (pol 2). Then, however, its polarization direction is rotated by another 45° in the Faraday rotator, so that this light will be blocked at the input polarizer, or can be sent to the separate output port. Note that the output polarizer (pol 2) is important if light may be reflected back with a modified polarization state. If the rotation angle of the Faraday rotator somewhat deviates from 45° (either due to fabrication errors or due to operation away from the design wavelength), the orientation of the output polarizer may still be adjusted for maximum transmission, but in that case the degree of isolation is reduced. It may be better to optimize that polarizer's orientation for maximum isolation, while accepting a somewhat higher insertion loss in forward direction. A polarization-insensitive Faraday isolator is a device which works for arbitrary polarization of the input beam. Such devices are often required in the context of fiber optics, because many fibers are not polarization-maintaining. In particular, optical fiber communication systems are usually operated with undefined polarization state, and Faraday isolators as well as other components are then required to work with arbitrary polarization states. The basic principle of a polarization-insensitive isolator is to first spatially separate the orthogonal polarization components of the input beam with some kind of polarizer, then send both through a Faraday rotator, and combine them again in the second polarizer. Figure 3: Setup of a polarization-insensitive Faraday isolator, with high transmission in forward direction (top) and a spatial offset for backward propagation (bottom). (The beam angles are exaggerated for better clarity.) In a fiber-coupled device, there is an additional lens on each side for collimating and re-focusing the beam. A type of device as frequently used in fiber optics is shown in Figure 3. Here, the polarizers are birefringent wedges, made e.g. of rutile (TiO2). Backward-propagating light of any polarization direction can be transmitted, but will appear with an offset beam position (Figure 3, bottom), and will thus not be launched back into the input fiber. Such devices can be fitted into rather compact packages, as shown in Figure 4. Figure 4: A fiber-coupled Faraday isolator. The photograph was kindly provided by Microwave Photonic Systems, Inc. There are also Faraday mirrors in similar housings, having only one fiber port and exhibiting a 90° polarization rotation for reflected light. Note that a polarization-insensitive isolator will in general not preserve the polarization state (or simply rotate it), since there is an arbitrary relative phase change between the two polarization components. That phase change depends on temperature and wavelength. For many applications, a low insertion loss, i.e., a low loss for forward-propagation light, is essential. The insertion loss is determined by several factors: the type and quality of the polarizers used, residual reflection losses on anti-reflection coatings, and the precision and uniformity with which a 45° rotation angle is obtained in the rotator. Another important performance figure of an optical isolator is the degree of isolation, i.e., the attenuation achieved for back-reflected light, also called return loss. Typical Faraday isolators achieve a return loss of the order of 30 to 40 dB. A high degree of isolation is generally more difficult to achieve for high-power devices, where the beam in the Faraday medium covers are larger area and is thus more sensitive to field inhomogeneities. The quality and alignment of the polarizers used is also important. A lower degree of isolation may result from operation at a non-optimized wavelength, from improper alignment or large divergence of the input, or from thermal effects when the isolator is operated with a high optical average power. If the return loss achievable with a single isolator is insufficient, a combination of two (or even more) isolators may be used. There are devices available where two isolators are packaged into one housing (double-stage isolators). Such a combination may also be used to widen the optical bandwidth with sufficient isolation. 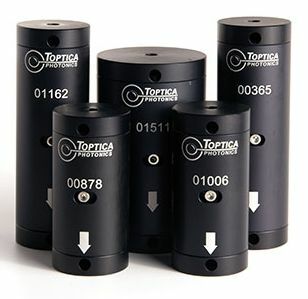 Some “tunable” isolators allow the user to adjust the angular orientation of the polarizers, and thus to optimize the isolation for different wavelengths. In that way, a single device may be used to cover a broad wavelength region, e.g. from 500 nm to 750 nm, limited only by the bandwidth of the anti-reflection coatings. For optimizing the bandwidth of a fixed setting (as required e.g. for use with a tunable titanium-sapphire laser), one requires a Faraday rotator based on a medium with a low relative wavelength dependence of the Verdet constant. For high average powers, the parasitic absorption in the Faraday rotator can cause substantial thermal lensing, which distorts the beam profile and can also affect the degree of isolation. High-power devices usually have exit ports for the rejected light, rather than internal absorbers, in order to avoid the associated heating inside the device. For high peak powers, optical damage may occur. To prevent this, a sufficiently large input aperture is required. High peak powers may also lead to self-focusing. The power limit depends not only on the input beam radius but also on the length of the device. Of course, not only the Faraday rotator, but also the polarizers have to be suitable for high-power operation. Commercially available high-power Faraday isolators can handle optical average powers up to the order of 100 W with not too strong beam distortions. Particularly some applications in combination with high-power fiber lasers and amplifiers demand higher powers, and more advanced devices for powers of the order of 1 kW appear are being developed. For fiber-coupled devices, the power levels are more limited, usually to well below 100 W.
It is possible to fabricate optical fibers from glasses with a high Verdet constant [1, 4, 9]. With such fibers, one can make entirely fiber-based (not only fiber-coupled) Faraday isolators. Although the performance achieved so far with that method does not reach that of bulk devices, this development may be useful for future fiber laser sources. In many cases, they are used to protect some laser or amplifier against back-reflected light. Amplifier chains sometimes contain several isolators between the different amplifier stages, preventing not only back-reflected light but also amplified spontaneous emission from having detrimental effects. 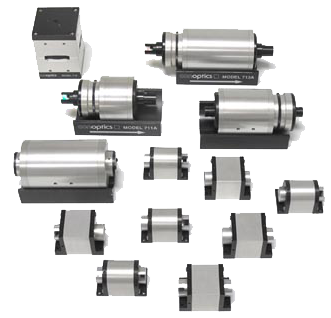 In optical fiber communication systems, polarization-insensitive fiber-coupled isolators are frequently used e.g. before and after any fiber amplifiers. Various kinds of interferometers and other devices (e.g. amplifiers) in bulk or fiber-optic form use circulators for separating reflected light from the forward-propagating beam. This allows e.g. to realize a double pass through an amplifier. The polarizing property of a polarization-dependent isolator within a laser resonator (e.g. of a fiber laser) may be exploited for enforcing a linear polarization state or for mode locking with nonlinear polarization rotation. There are also various applications of pure Faraday rotators, not functioning as isolators.